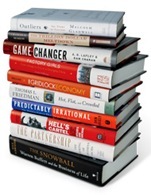 Just in time for the Holiday shopping season, Hardy Green wrote an article in the December 15, 2008 issue of BusinessWeek about the year’s best business books. Excellent Reading from a Terrible Year – In 2008’s top 10 business books, you’ll find titans who act like school boys and management lessons from P&G. So give Santa a hand and buy some great winter reading for you or somebody special! Tagged with business books, BusinessWeek.